A simulation of black holes merging. Illustration credit: © Michael Koppitz / Albert Einstein Institute. For scientists gravitational waves exert a powerful appeal, as it is believed they carry information allowing us to look back into the very beginnings of the universe. Although there is strong circumstantial evidence for their existence, they have not yet been directly detected. Dr. Ryan Shannon (CSIRO and ICRAR). Image credit: © Wheeler Studios. 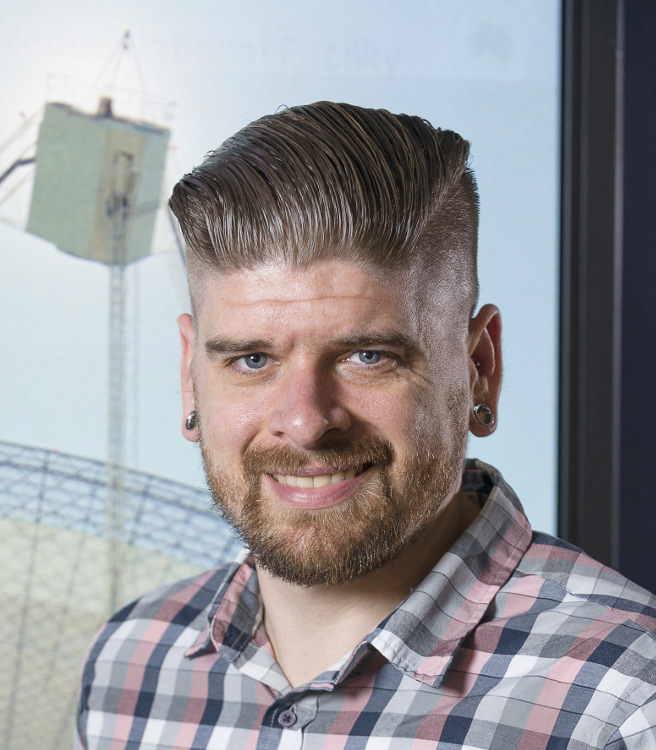 The work, led by Dr. Ryan Shannon (of CSIRO and the International Centre for Radio Astronomy Research), has just been published in the journal Science. Using Parkes, the scientists expected to detect a background ‘rumble’ of the waves, coming from the merging galaxies throughout the universe, but they weren’t there. The world-first research has caused scientists to think about the universe in a different way. “In terms of gravitational waves it seems to be all quiet on the cosmic front. However by pushing our telescopes to the limits required for this sort of cosmic search we’re moving into new frontiers, forcing ourselves to understand how galaxies and black holes work,” Dr. Shannon said. The fact that gravitational waves weren’t detected goes against theoretical expectations and throws our current understanding of black holes into question. Galaxies grow by merging and every large one is thought to have a supermassive black hole at its heart. When two galaxies unite, the black holes are drawn together and form an orbiting pair. At this point, Einstein’s theory is expected to take hold, with the pair predicted to succumb to a death spiral, sending ripples known as gravitational waves through space-time, the very fabric of the universe. Although Einstein’s general theory of relativity has withstood every test thrown at it by scientists, directly detecting gravitational waves remain the one missing piece of the puzzle. 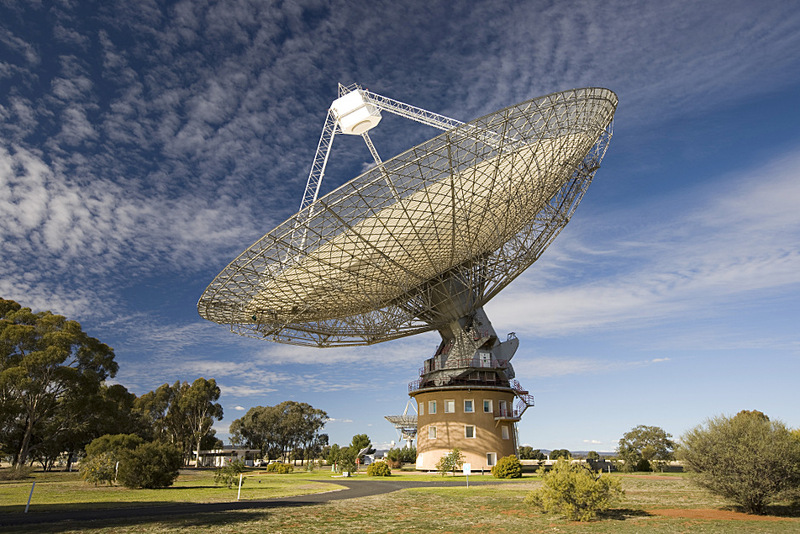 Parkes Observatory, just outside the central-west New South Wales town of Parkes in Australia, hosts the 64-metre Parkes radio telescope, one of the telescopes comprising CSIRO’s Australia Telescope National Facility. Image credit: CSIRO / ICRAR. To look for the waves, Dr. Shannon’s team used the Parkes telescope to monitor a set of ‘millisecond pulsars.’ These small stars produce highly regular trains of radio pulses and act like clocks in space. 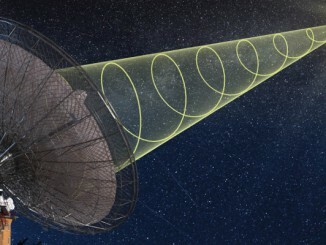 The scientists recorded the arrival times of the pulsar signals to an accuracy of ten billionths of a second. A gravitational wave passing between Earth and a millisecond pulsar squeezes and stretches space, changing the distance between them by about 10 metres — a tiny fraction of the pulsar’s distance from Earth. This changes, very slightly, the time that the pulsar’s signals arrive on Earth. The scientists studied their pulsars for 11 years, which should have been long enough to reveal gravitational waves. So why haven’t they been found? There could be a few reasons, but the scientists suspect it’s because black holes merge very fast, spending little time spiraling together and generating gravitational waves. “There could be gas surrounding the black holes that creates friction and carries away their energy, letting them come to the clinch quite quickly,” said team member Dr. Paul Lasky, a postdoctoral research fellow at Monash University. Whatever the explanation, it means that if astronomers want to detect gravitational waves by timing pulsars they’ll have to record them for many more years. “There might also be an advantage in going to a higher frequency,” said Dr. Lindley Lentati of the University of Cambridge, UK, a member of the research team who specializes in pulsar-timing techniques. Astronomers will also gain an advantage with the highly sensitive Square Kilometre Array telescope, set to start construction in 2018. 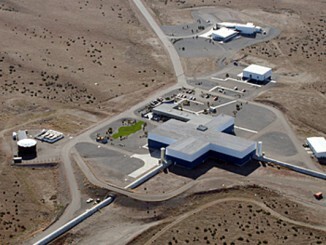 Not finding gravitational waves through pulsar timing has no implications for ground-based gravitational wave detectors such as Advanced LIGO (the Laser Interferometer Gravitational-Wave Observatory), which began its own observations of the universe last week. 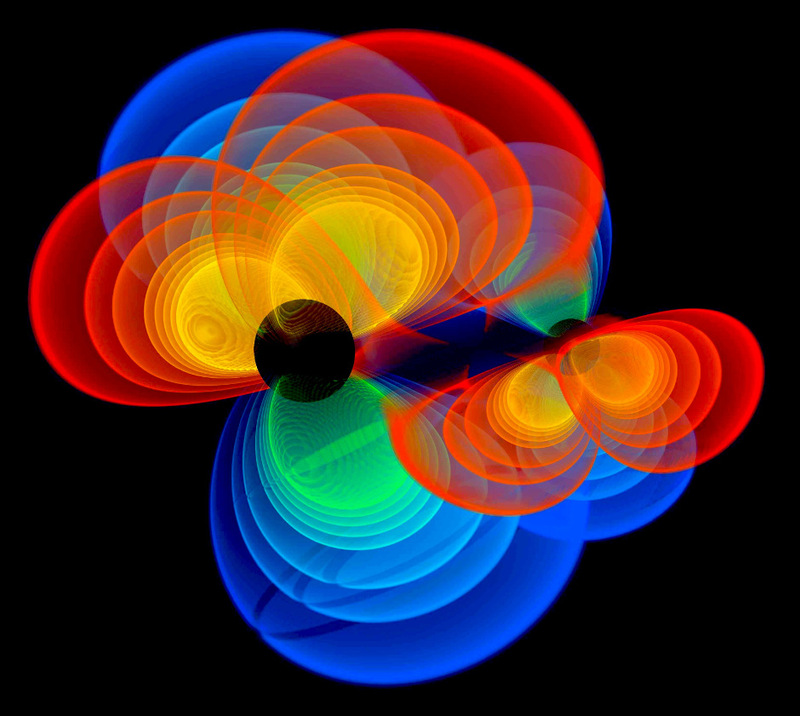 “Ground-based detectors are looking for higher-frequency gravitational waves generated by other sources, such as coalescing neutron stars,” said Dr. Vikram Ravi, a member of the research team from Swinburne University (now at Caltech, in Pasadena, California). 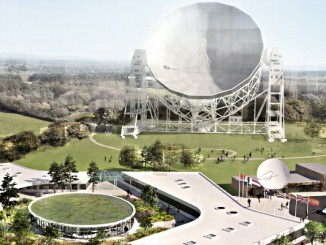 At their 29th April meeting, members of the Square Kilometre Array (SKA) Organisation decided that negotiations should start with the UK government to locate the permanent headquarters of the SKA project at the University of Manchester’s Jodrell Bank site. Having developed a technique to search for real-time ‘fast radio bursts,’ a team of astronomers in Australia has succeeded in observing the first ‘live’ burst with the Parkes telescope from a source up to 5.5 billion light-years from Earth. This year marks the 100th anniversary of the first publication of Albert Einstein’s prediction of the existence of gravitational waves. With interest in this topic piqued by the centennial, researchers from UK universities in Glasgow, Birmingham, and Cardiff will discuss their ongoing efforts to observe and measure cosmic gravitational waves for scientific research in London on Thursday, 11 February.